Written below are lists containing the craft supplies, games, supplemental materials, and books suggested throughout the 3 Year Curriculum. While the lists may seem daunting at first, I believe that you will find the vast majority of the supplies already in your home. If they are not, I suggest that these items be available for your child to use and play with to expose your child to many textures, activities, books, and play. Items are divided into categories to make them easier to find and linked to Amazon so that you view a picture of each item. Most of these items should also be available at your local supermarket but may be substituted with other items on hand. 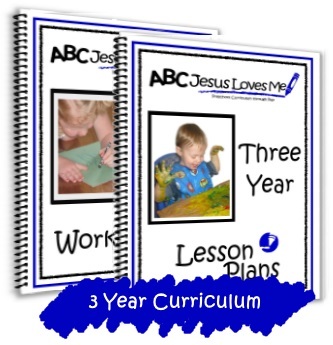 View the 3 Year Weekly Lesson Plans to see how each item is used. Again, do not get overwhelmed by this list. Substitute items and books with what you already have in your home. Week 2 Who Made the World? , Mr. Brown Can Moo! Can You? Week 4 Five Little Ducks , Mr. Brown Can Moo! Can You? , Is Your Mama a Llama? Week 6 Three Little Pigs , Three Billy-Goats , Three Bears , Three Little Kittens, Go, Dog, Go! Week 10 The Pumpkin Gospel , Frog, Where Are You? Week 21 Are You My Mother? Week 23 Ten Apples Up On Top! Week 24 Hop on Pop , Are You My Mother? , The Pigeon Wants a Puppy , Ten Apples Up On Top! Week 35 How Will We Get to the Beach? Week 36 Sheep in a Jeep , How Will We Get to the Beach? *DVD's - These DVD's are all optional. _______ Veggie Tales: Where’s God When I am Scared?